First, poach the peaches in water for two minutes or less. Peel the fruit, remove the pits and dip the fruit in cold water to end the cooking process. To make the syrup, bring the sugar, water and lemon juice to a boil (California chef Wolfgang Puck suggests adding lemon zest and a vanilla pod). Set aside to cool for 10 minutes. Immerse the peaches in the syrup and let them cool. (If you’re lazy, use canned peaches in light syrup). Use the blender to mix the ingredients for the raspberry sauce. To assemble, place half a peach in each plate (or in a transparent fruit dish), and cover with a scoop of ice cream, (Careful! Not all vanilla ice creams are equal. Pick a superior quality ice cream! ), mask with the raspberry sauce. Garnish with a little?whipped cream and some roasted almonds (and why not a wafer). Music has always gone well with fine food. After all, how else can one imagine a sumptuous banquet not accompanied by the pleasant sounds of court musicians or, for the not so well-to-do, by the recording of a favourite classical piece? Still, the link between music, heavenly food, and the culinary arts does not stop there: at one time or another, chefs have created delicious dishes inspired by renowned composers or interpreters. With this article, La Scena Musicale begins a new series that will combine the pleasures of sound and palate. 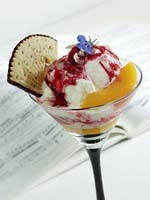 What could be better for our overheated brains on a hot summer night than the classical Peach Melba, peaches poached in light syrup (or champagne, why not!) and a simple scoop of vanilla-flavoured ice cream covered in raspberry sauce? Something light and delicious that even the most anxiety-ridden weight-conscious will swallow without regret. Who was this mysterious Melba, whose name is also related to light toast, a doll, a kind of wafer, and to a variety of annuals? Though she went by the name of Nellie Melba, her real name was Helen Porter Mitchell. She was born in Australia on May 19, 1861. She chose Melba, a diminutive of Melbourne, as her surname out of love for her country. Her family was very musical, but Pietro Cecchi discovered the select Presbyterian Ladies’ College student’s undeveloped vocal potential only in 1880. After a disastrous marriage and the birth of a son, she left Australia in 1886 to pursue her musical interest. She studied with the great Madame Marchesi and had her début in Brussels, after which she quickly became one of the best known divas of Covent Garden. For 37 years, from 1889 to 1926, she reigned supreme in London’s operatic temple. She died on February 23, 1931, in Sydney, following complications from failed cosmetic surgery. The great French chef Auguste Escoffier is the creator of the dessert that bears her name. There are a few variations on the theme (among other things I noted a French bread recipe with Peach Melba and some Peach Melba freezes: cocktails made with peach schnapps, raspberry liqueur, hazelnut liqueur, vanilla ice cream, and raspberry sauce). But the basic concept is always the same.